The water cooled UNIBLOCK is an UPS system, fitted with an unique totally enclosed water to air cooling system. The closed cooling air/water circuit eliminates the need for additional air-conditioning or ventilation systems. The UNIBLOCK can be installed in small rooms or in hazardous environments that contains dust and aerosols. A: The enclosed air circuit is operated by an internal fan impeller incorporated in the rotor of the electrical machine. 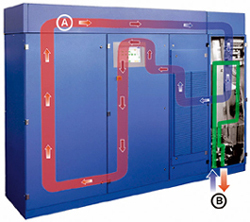 B: The UNIBLOCK with built-in water cooling is connected to the chilled water circuit of the building.